Railway Minister Suresh Prabhakar Prabhu's ambitious plans for the Indian railways are known to all. The man wants to improve the state of Indian railways and modernize it with top-notch amenities. Just a few days back, we heard of designer 'Make in India' coaches and saw some amazing pics. Yesterday, we got the news that Railways Ministry is inviting suggestions and innovative ideas from the public to include them in its forthcoming budget. "We have sought suggestions and innovative ideas from public for the Rail Budget 2016-17, slated to be presented in the last week of February next year," a senior Railway Ministry official told PTI. And today, Ministry of Railways revealed its plans of building the world's Highest Rail Bridge over the Chenab River. 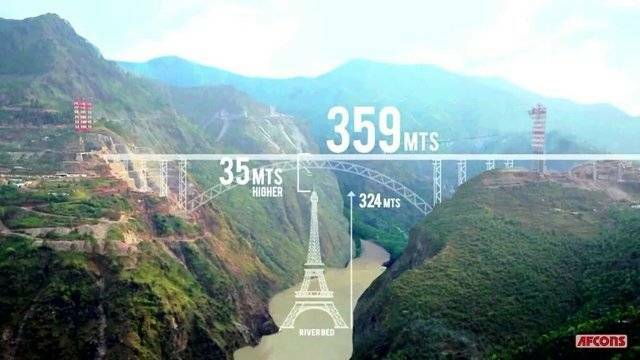 This bridge would be built on a height of 359 meters, which will be 35 meters higher than the Eiffel Tower in Paris. It seems like another World Wonder is in the making. What do you think?